Today would have been my father’s 94th birthday. 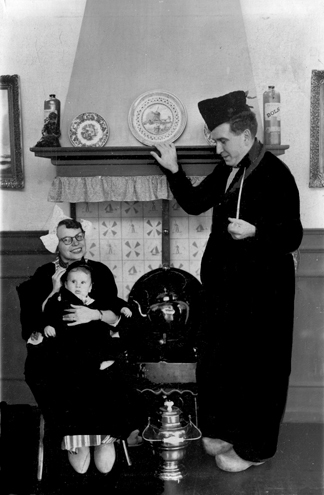 Abe died in 1998, and I think of him every year on his birthday … just as my mother thought of HER father every day on his. I miss him, but I enjoy remembering his wise, funny spirit. I have learned a few things in the past year about my father. As most of you know, my book about my mother is coming out in June (look here for a preview!). The book deals mostly with her last year, but I couldn’t write about the end of her life without meandering a bit through the rest of that life. My research and writing about her inevitably led to my father. 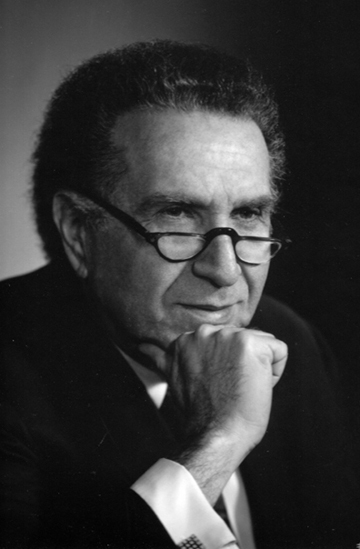 Here are three of the things I have learned recently about Abe Weisblat. 1. Abe actually considered becoming a farmer. My father’s family came to this country from Poland when he was a little under two years old. At some point in college, he became interested in agricultural economics—in large part, I think, because he saw that field as a way of helping poor agrarian people in the United States and abroad move into parity with their urban, often richer, neighbors. At present Abe is a graduate student in [agricultural economics]. He hopes to own a 120 acre farm and teach at the University someday. Added to all this is an interest in sports, a lust for square dancing, and a hobby of collecting first editions. I have a feeling that the desire to farm (along with the love of square dancing) disappeared sometime within the next year as my father did a little work on a farm near the university. 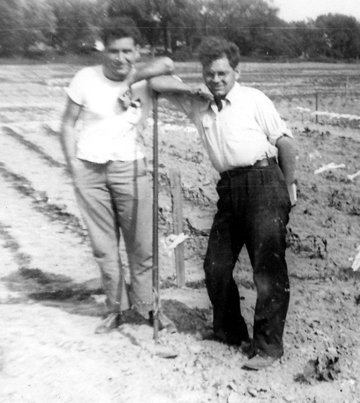 Here he is with his friend Ervin Long in a radish patch. My understanding is that my father managed to grow exactly one radish and never tried growing anything ever again. Abe (left) and Ervin rest after their labors. Still, it’s fun to know that he actually considered farming. 2. Another fact I have learned is that my father wrote letters home from a trip he took in the winter of 1946-1947 to Occupied Japan. (I had known about the trip but not about the letters.) He was then working for the Department of Agriculture in Washington. He and a few other social scientists were borrowed by the Army to conduct a survey of American forces in Japan to determine what new dress uniforms the troops would like to wear. The topic was so bizarre that many of his friends thought he was actually spying, that the uniform survey was a cover. He always maintained that the survey was genuine, however. And he was emphatically NOT the spying type. His analysis of the plight of the residents of the cities he visited–which included Tokyo, Osaka, and Nagoya–is heartbreaking. He went on this mission at the coldest time of the year, and his heart went out to people trying to stay warm in a country that was still pretty much bombed out. He was highly critical of the U.S. military personnel he met, who frequently took advantage of the Japanese. I’m hoping to write an article about these letters soon; they are insightful and touching. 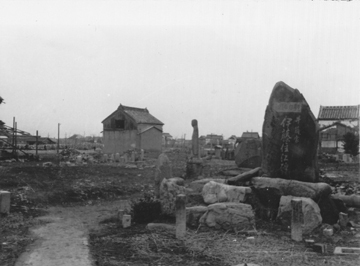 My father took this photo of bomb damage in Nagoya in February 1947. 3. My last big revelation about my father isn’t a revelation at all, but a reminder. He was deeply thoughtful and very smart. Here is an excerpt from a letter he wrote to my mother in 1953 (they were briefly separated during a trip to Europe) after visiting the cathedral in Toledo, Spain. The Cathedral dominates all—for there is none comparable to it in Europe. The wealth of South America and Spain is in that church. It’s hard to describe—iron grill works that have to be seen to be believed, treasures that defy description, a gold replica of the church, one of the loveliest Madonnas encrusted with jewels, the jewel of the El Greco collection. At least 24 of his greatest works—illuminated manuscripts—one magnificent altar after another. Its structure is elaborate Gothic and simply goes on and on. But I must say that it left me with a completely different feeling from Chartres. At Chartres I felt I understood why people came to worship God. Here all I felt was the power of the Catholic church—its ability to command an edifice that combines all the wealth of many centuries. It’s proud of its church and rightly so—but to worship in it would leave me in awe and fear—it’s so grand—so bewildering—so mystical. Chartres was warm—it felt like you were where God would be kind and listen and be with you. At Toledo he would simply look down. I love the way in which his prose moves from a description of architecture and decoration in a church to what the architecture and decoration say about hierarchy and theology. This is the only photo I have of my father from that trip in 1953; here he is in Holland with my mother and my older brother. I could go on and on, but I know I have to stick a recipe in here. So here is one of Abe’s standbys. He was emphatically NOT a cook. As I wrote in my last post about him, when he was alone his favorite evening meal was a martini accompanied by pickled herring on matzo. He enjoyed this repast because he could get by with washing only a glass, a small plate, and a fork. And he believed that putting several olives in his martini gave the meal balance. One of his other favorite meals was salami and eggs. This particular recipe does involve a small amount of chopping and a small amount of cooking. Nevertheless, it calls for only two ingredients. And the chopping and cooking take five minutes tops. My father could eat salami and eggs for breakfast, lunch, or supper. Luckily, my dear friends Peter and Ken sent me a special treat for Christmas from Zabar’s. (They know that one of the things I miss most about the New York area is kosher food!) The New York Sandwich Kit included pastrami, corned beef, deli mustard, rye bread, and kosher salami—all in a cute little Zabar’s insulated tote. My family and I polished off the other meats and the bread almost immediately, but we knew that the salami would last for a while in the refrigerator so I have only recently opened it. I’m enjoying hugely … as I am enjoying remembering my father. 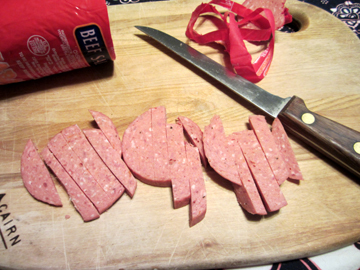 Cut the salami slices into 5 or 6 pieces, and cut some of those pieces in half. Pop the salami pieces into a small, nonstick frying pan over medium heat. (In the olden days my father didn’t use a nonstick pan, but believe it or not kosher salami isn’t quite as fatty is it used to be, so the nonstick pan helps.) Toss them around until they brown. 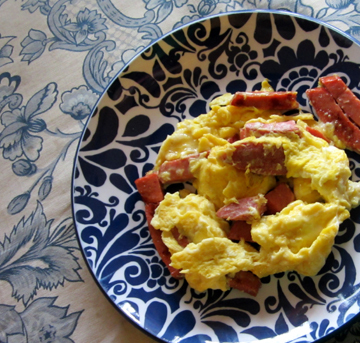 Whisk the eggs together, pour them over the salami pieces, and quickly toss and cook. Depending on hunger and time of day (and what if anything else is being served), this serves 1 to 2. I ate most of a recipe for lunch yesterday, with a little left over for my dog. I leave you with one more dear quotation from Abe. This was on the back of a postcard he sent to my brother and me when we were very little, after his first visit to the Parthenon. There is a lovely story that God’s hand touches those who have seen the Taj Mahal and Parthenon. NOW I know why—and someday he will touch both of you.